BSX Records presents music from the 1983 dramatic miniseries, ALL THE RIVERS RUN, directed by Pino Amenta and George Miller, based on the best-selling novel by Nancy Cato, starring John Waters (BREAKER MORANT, THE LOST WORLD) as Brenton Edwards and the eternally beautiful Sigrid Thornton (THE MAN FROM SNOWY RIVER, THE LIGHTHORSEMEN) as Philadelphia Gordon, featuring music composed and conducted by Bruce Rowland. 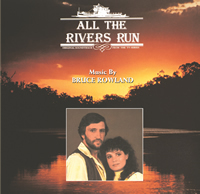 ALL THE RIVERS RUN tells the story of the love between a woman, a man and the river that binds them together, a majestic romance set against the breathtaking splendour of the Murray River during Australia’s turbulent, pioneering 1890s. Bruce Rowland is one of Australia's most successful and highly-acclaimed composers. He is well-known internationally, and has an extensive and impressive list of films and awards to his credit, including motion pictures such as THE MAN FROM SNOWY RIVER, PHAR LAP and RETURN TO SNOWY RIVER and television miniseries such as ANZACS and TRACKS OF GLORY. BSX Records presents ALL THE RIVERS RUN for the first time on compact disc, containing more music than the previous Swedish album release. The music has been remastered for improved sound and also includes music from the 1990 sequel miniseries, ALL THE RIVERS RUN II.